Oxidative stress contributes significantly to the pathogenesis of common eye disorders in older Americans. 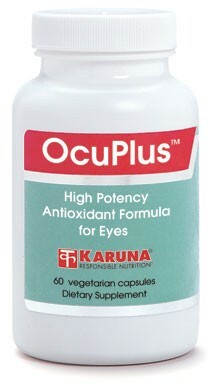 OcuPlus is a broad spectrum formula combining antioxidant nutrients and botanicals associated with protection of eye structures. 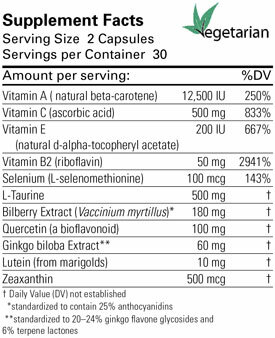 Individuals with low plasma concentrations of carotenoids and antioxidant vitamins are at increased risk for undesirable age-related changes in the eyes; carotenoids and antioxidant vitamins may help to retard some of these destructive processes (Am J Clin Nutr 1995 Dec;62:1448S-1461S). The flavonoid quercetin inhibits aldose reductase, which may reduce accumulation of sorbitol byproducts in the ocular lens (Biochem Pharm 1976;25:2505-2513). Bilberry is high in anthocyanoside flavonoids that possess potent antioxidant activity, and show promise in protecting eye tissues from oxidative damage (Ann Ottamol Clin Ocul 1989;115:109; Ann Ottalmol Clin Ocul 1987;113:1173-7). Ginkgo biloba extract has an antioxidant, free-radical scavenger effect on the retina; it inhibits or reduces damage caused by oxidative insults (Int J Tissue React 1995;17: 93-100). Taurine, a conditionally-essential sulfur amino acid, is found in high concentration in the retina, where it participates in photoreceptor function and provides protection from lipid peroxidation (Neurochem Res 2004;29:151-60; Nutr Rev 1975;33:343-7).